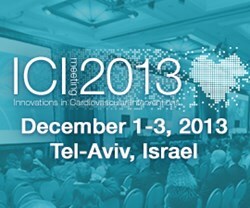 Innovations in Cardiovascular Interventions - ICI 2013 - the premier International Conference for Interventional Cardiologists, Innovators and High-Tech Life Science Industry, is reconvening in Tel-Aviv in December 1-3, 2013. Bernard Ross, CEO of Sky Medical Technology Limited, which won the award for 2012, said that “We are honored to have won this prestigious Award, judged by some of the world’s foremost experts in the field." Whether you are a cardiologist, an innovative scientist specializing in Cardiovascular Intervention, Neurovascular Innovations or Valvular Therapeutics, a Mobile Health solutions developer, an entrepreneur from the medical industry, or an investor looking for the next financial opportunity – do not miss this meeting. As in previous meetings, the upcoming ICI meeting will focus on Innovative Technology and Therapies and will cover all stages of the innovation process from the bench to the patient bedside. The ICI Program will include presentations from international and Israeli experts focusing on new therapies and research, alongside thematic live case presentations to present the impact of these technologies on current and future therapy. Since ICI focused on new technologies, some of its most interesting sessions are the emerging technology sessions, industry-academia discussions and a review of the regulatory, ethical and financial aspects of new devices. There are many meetings on cardiology and cardiovascular interventions, but ICI has become known as the leading meeting for Interventional Cardiologists, Innovators, Entrepreneurs and the Industry. This meeting can be a jumping board for new companies with brilliant and creative new ideas that have the potential to change lives. This meeting can really help your business move "from idea to reality." This Competition provides a platform for clinicians and entrepreneurial Startup companies to present novel innovations that have the potential to significantly impact the future of Heart Brain and Peripheral Vessels intervention medicine. If you have a brilliant new idea, and believe you are able to persuade a panel of experts including front line clinicians and active investors – enter the competition today and have the unique opportunity to obtain personal critical peer review and feedback. Start-Up companies are always in need of financial support – but some things money just can't buy. The professional exposure and validation by the field's biggest experts is priceless. Winning the ICI Innovation Award offers unparalleled clinical and commercial exposure and validation, helping you progress your innovation towards benefiting patients. Apply now to present at the 2013 ICI Innovation Awards. The ICI Academy of Innovation is a practical and experiential 1-Day "Hands-On" workshop which provides tools on how to transform a genius idea in the medical field from theory to reality. ICI's participants are doctors and innovators who understand the medical rationale but wish to learn the processes of investigating the market's needs, copyrights, patent licensing, regulation, authorization, funding etc. This program, sponsored by Medtronic, consists of half a day of lectures by the biggest experts in the field and half a day of a practical, "hands on" and FUN workshop. ICI also provides a wonderful opportunity to expand upon the unique skills needed in order to develop new biomedical technologies and take the critical first steps in invention, patenting, early prototyping and development of new concepts. The Academy of Innovation day will include The Incubator concept, Assessing the need and the market, How to excel in applied research, Steps in securing intellectual properties, Patent applications and more. Take this opportunity and join us for the Academy of Innovation day. ICI 2013 will be held at the luxurious David Intercontinental hotel in Tel Aviv, the largest city and biggest commercial center in Israel. Being a busy metropolis, this city inspires visitors with a unique energetic atmosphere of excitement and fun. Tel Aviv’s seafront skyscrapers and exclusive hotels are visible from a distance, presenting a lively combination of entertainment venues, shopping malls, exotic markets, a nonstop active nightlife, beautiful golden beaches and all kinds of wonderful restaurants. When your day at the conference ends, Tel Aviv's Night-life only begins. Read here for more information about ICI 2013.